No longer the main event? Beverage Digest released its topline volume numbers for 2008... and CSD volume at the big beverage companies is declining. Frankly this is not really news, its been a trend for a number of years but the news media has been all over this today (Atlanta Journal quoted above). The 2008 number is -3%, in line with most analyst expectations, driven by cola declines (again in line). Gainers are Red Bull, Hansen's and my old company - Dr Pepper Snapple. It will be interesting to watch 2009 as prices of non-carbonated beverage become comparatively higher priced and CSDs become a better value. As Brand Manager of RC it used to be that a 3 Liter of RC had greater interaction with the price of milk in some markets... families are often just trying to put the best priced beverage on the table. This dynamic will also drive the growth of Private Label, which is now at a significant savings against branded CSDs. I often get questions about energy drinks, their future and who is winning. So here are some thoughts. Red Bull - Its very interesting that they have moved away from their cartoon-based international campaign and into a US market, local personality campaign. Red Bull is a massive TV advertiser (over $50M a year) and this is a big departure for them. It signals that they believe the US market is different, and that they need to better market to their consumers here. The commercial above is both spectacular and personal, dimensionalizing "gives you wings" in a very aspirational way. Monster - The cut over of distribution from the independent networks to CCE is still in progress, but it is interesting that there has been little innovation from the folks in Corona this year - save for their own entry into the energy shots - a segment in overkill already. Rockstar - Another business in transition as it moves into PBG for distribution. Aside for some new sponsorships, again there has been little in the way of energy innovation. They will be hoping that a better aligned distribution system will help grow their business. Overall the 10% growth that the category enjoyed in 2008 was higher than many expected. My feeling is that these products have become more mainstream, and will continue their growth as long as energy from communications and excitement from new ideas fuels the category. The issue may be that the momentum enjoyed by the Monster and Rockstar businesses may be mitigated within the portfolio selling selling constructs of CCE and PBG. Maybe this is a year for Red Bull after losing share for 4 straight years. Time will tell! Are energy drinks that bad for teens? Big Red Boots is one of the many interesting bloggers on energy drinks in the interweb (also check out taurinerules.com and energyfiend.com) . He does unbiased reviews of the various alternatives out there, and published an interesting article on the subject today. In the article he attempts to lay out the real risks associated with teens consuming energy drinks in an attempt to offset the normal press sensationalism that is associated with coverage of the category. Indeed google "energy drinks teens" and a succession of demonizing articles appear from all kinds of websites. His net that the sugar in energy drinks is a bigger risk than the caffeine is absolutely correct: I hope that the article gets the coverage it deserves. Having worked for over a decade for Snapple as the benefits of tea as a potent source of anti-oxidants that may fight cancer and slow the aging process became broadly known (not that we could ever legally make those claims), it is with interest that I came across this story on tea from the BBC. Apparently consuming hot tea (above 70 Centigrade - really hot) can increase the likelihood of throat cancer according to a study in Iran. 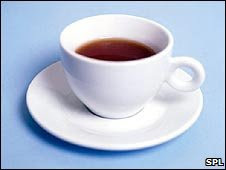 But - read deeper in the article and you discover that these scientists believe that it is really the chugging of very hot drinks that distresses the lining of the throat, and increases the chance of carcinoma. So... this is more about drinking scalding beverages rather than tea being bad for you, and begs the question whether the sensational headline about tea has any real relevance to the story. But I guess this makes Iced Tea a more attractive option (cue cheering from Lipton, Snapple, AriZona, Nestea, Sweet Leaf, New Leaf etc etc). 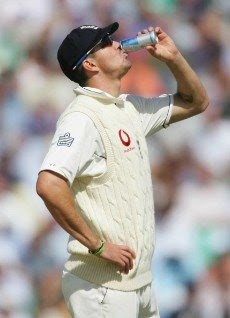 Kevin Pietersen, England cricketer obviously believes that caffeine helps. There is a constant debate in the sports nutrition community: Does the stimulant effect of caffeine outweigh its diuretic effects? Today's New York Times carries an article that says that caffeine can improve performance. Frankly that is not really news, but it does represent a change in approach from the normal "caffeine is bad" coverage that normally occurs. It also has commentary from a specialist sports nutritionist saying that with the right amount of caffeine with regular use, the diuretic effect is diminished. Take a walk through your local health club or GNC and you will discover any number of caffeine-based sports stimulants: Products like Redline, Spikeshooter and Endorush all seek to maximize performance through caffeine. For me, I cannot take too much caffeine before a game - I lose concentration: So it ends up being a personal preference. Of my own sporting heros, Kevin Pietersen, England cricketer consumes vast amounts of Red Bull while on the field, his flapping arms signal to the dressing room that he needs another drink (gives you wings... geddit?). And the impact on him... well there is the natural talent but that also probably helps. (See KP wack a cricket ball here). 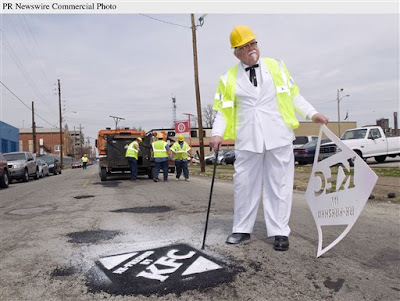 KFC has come up with a great way to make a difference in their local community; by sponsoring pot hole repairs, then stenciling a brand message on top (a message that will wash away with the rain). Its a brilliant move - it helps their community with a service that benefits just about everyone. And turns a mundane inconvenience into a significant way to boost consumer goodwill. My hope is that the road crews have their own colonel dressed up and working on the team. (Note that in the photo above, the colonel has been in charge of the stenciling - see the white chalk on his right boot.) That would really "commit to the bit" and push the envelope. Making pot hole repair event marketing. And imagine the merchanidisng opportunity on the traffic report - the KFC pot hole filling becomes an event! I just hope other brands take the lead of KFC. Imagine a world where Ronald McDonald and the Hamburgler are sweeping streets, Mr Clean is scrubbing public restrooms, or Snuggle is helping people fold their smalls at laundrettes... Brilliant! Retail trips by consumers are down, but basket ring per trip is up. My inference, consumers are becoming less impulsive and more calculated in how they are spending their cash. In effect they are shopping bargains, items that provide a bang for the buck and items that they perceive to generally improve their lives. At the end of the article they highlight that investment during a recession often leads to an improved postion during the next growth phase. Of course the only issue is having the confidence to get from here to there. 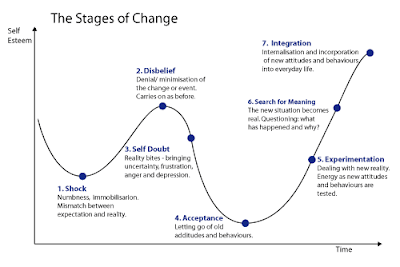 So where are we on the curve?? Today's New York Times had a very interesting piece on the impact of recession changing the competitive dynamics of industry: It started me thinking about the implications for the millions of us out here trying to find our own way out of the situation. In short the NYT's thesis is that recessions change the status quo: And these changes result in opportunity. The opportunities can manifest in any number of ways - from creating new low cost producers to businesses that lead consumer needs and get to the marketplace before competitors. But for me, the most interesting comments are that recession creates ideators who do not have existing job stability at risk, they have a low input cost environment, and a low cost/high quality labor pool available to help execute their plans. 1) The opportunity is too small to expend resources on. 2) The opportunity is not congruent with the conventional wisdom of their business strategy. 3) Pursuing the opportunity creates internal political divisions that cannot be easily resolved. As a result the opportunity to win is in not only building on an unmet consumer need, but also using the leverage of small, un-encumbered businesses to build strategies that big competitors cannot easily match. POM has been a recent exponent of this, building a super-premium priced offering, and taking the product to consumers through the produce section of grocery stores. So we can add another item to the list of Canada Vs USA differences. 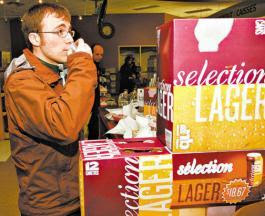 The State Control Board of New Brunswick launched its own beer this week - a non-descript, cheap lager "in an effort to head off dropping suds sales that have hit it in the pocketbook" to quote the Globe and Mail. Amongst the sensationalism of Blackstone Group's Steve Schwartzman's opinion that 45% of the world's wealth has been destroyed, some common sense is hidden. Where are there investment opportunities? Boring old Consumer Packaged Goods. In fact, this trend is also brought out Time article. Time asked Nielsen what product area are growing and what is contracting. The big winners were ways to stay home and avoid spending money out: Hence the interest not only in the "poor man's opera", but also baking ingredients and cheap alcohol to drink at home. The losers? Bottled Water, cough and cold remedies and sports trading cards. We all have seen an increase in the popularity of antioxidants as sought after food nutrient. These are miracle molecules that arrest the oxidation of cells that and theoretically slow the decay of cells in the body. The implied impact being is to slow aging, improve health - and maybe reduce risk of cancer. All manner of beverages have benefited from these observations..
First Green Tea benefited from the growth, then all manner of high-antioxiant fruits including Pomegranates, Blueberries and Acai berries. 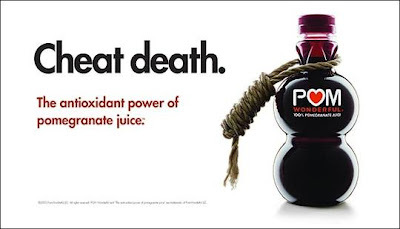 Brands like POM Wonderful have established themselves making grandiose promises, and multi-level marketers (like Mona Vie) are selling superfuits as panaceas. Today though, the New York Times ran a really interesting piece on Acai - one of the superfruits that has benefited from the trend. In short, the article is skeptical of acai's functionality - and ultimately poses the big question - are anti-oxidants snake oil, or do they have a tangible benefit? There is little doubt that antioxidants can have a positive impact, but precisely what impact from what product form is the big question. For beverages much is at risk, and as the marketing claims get more aggressive, the risks increase.